T. farfara L., Sp. Pl. 865 (1753). Ic: Ross-Craig, Draw. Brit. Pl. 16: t. 20(1961); Polunin, Fls. Europe t. 149 (1969). Leaves petiolate, lamina 10-20(-30) cm diam., with rather acute lobes, margin irregularly toothed, at first white-floccose on both sides, becoming glabrous above. Scapes 4-15 cm (lengthening in fruit to c. 30 cm), with numerous purplish scale-leaves, floccose, erect in bud, nodding after anthesis. Capitula 1.5-2.5 cm broad. Phyllaries linear, obtuse, often purplish and white-hairy, sometimes with black glandular hairs. Achenes 3-4 mm. Pappus 10-15 mm. Fl. 3-4. Waste and sandy places, damp ground, s.1.-2400 m.
Described from Europe (Hb. Linn. 995/10, photo!). 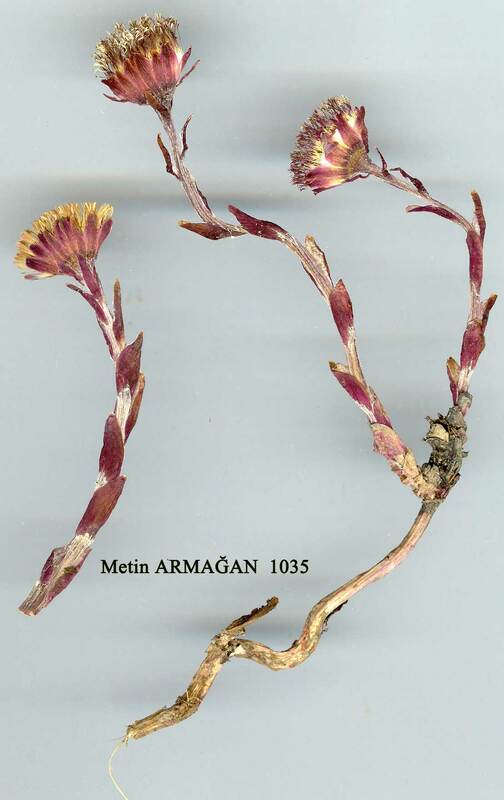 Widespread except in E. Anatolia; commonest in N. Turkey. A1(E) Tekirdağ: Gölçük Köyü, A.Baytop (ISTE 13503)! A1(A)Çanakkale: Renkoei (Erenköy). Sint. 1883:279! A2(E) Istanbul: Therapia (Tarabya), 29 iii 1896, Azn.! A2(A) Istanbul: Beicos (Beykoz), 16 ix 1900, Azn.! A3 Bolu: below Abant G., 1200 m, D. 37268! A4 Kastamonu: Tosya, Karadere to Devrendi, Sint. 1892:3830! A5 Samsun: Çetirli Pinar Köy, Bafra, 70 m, Tobey 450a! A6 Samsun: 3 km N. W. of Samsun, 10 m, Tobey 450! A7 Gümüşane: above Gümüşane, Sint. 1894:5429! A8 Erzurum: Kop Da. pass, 2400 m, Tobey 2069! Bl Izmir: Yamanlar Da., Kara G., 13 iii 1969, Fitz & Spitz.! B4 Ankara: Beynam Orman, Kasapligil. B6 Sivas: Sivas, Maunsell! B7 Elaziğ: Maden, Romieux s.n. B8 Erzurum: nr Erzurum, Calvert & Zohrab! C2 Antalya: Ak Da., 1300 m, Sorger 68-25a-10! C3 Isparta: Dedegöl Da., 1400 m, Sorger 66-45-7! C4 Konya: 20 km W. of Konya, 1300 m, 2 iii 1969, Fitz & Spitz.! C5 Niğde: Ulukişla to Pozanti, 900 m, D. 26309! C6 Hatay: Amanus, Hasan Beyli to Osmaniye, 500-800 m, Haradj. 3940. Is: Samos, Runemark & Snogerup 19418. Europe except extreme N., N. & W. Asia, N. Africa. Euro-Sib. element. Introduced in N. America. 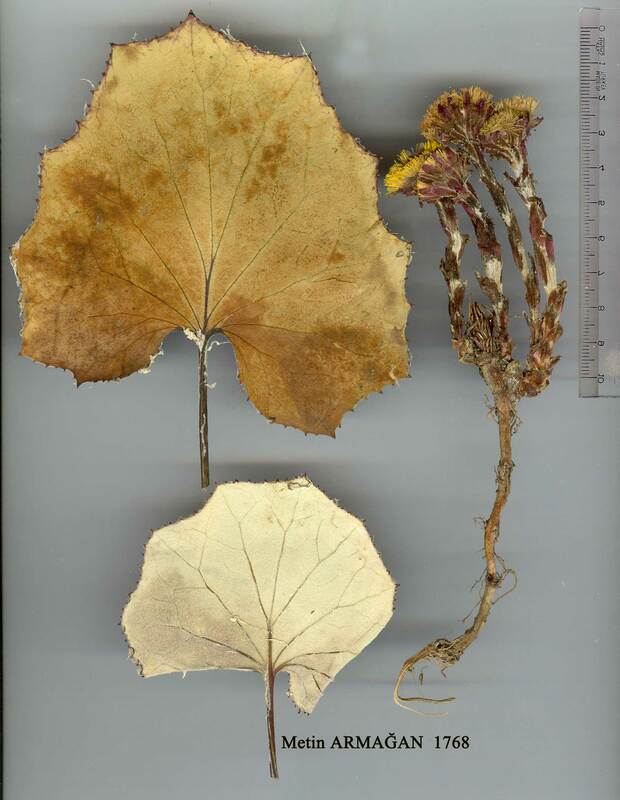 The leaves of this species are medicinal.